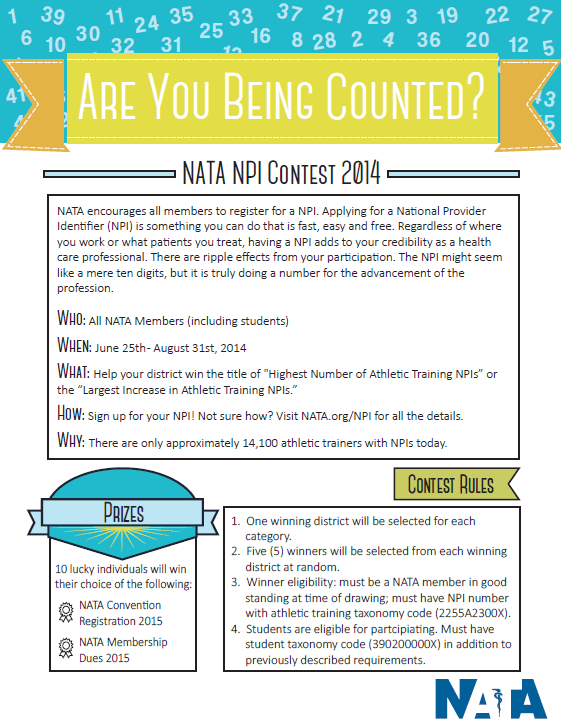 Far West Athletic Trainers Association › Do You Have Your NPI Number? HomeNewsPostsDo You Have Your NPI Number? Do You Have Your NPI Number? Applying for an NPI number is quick, easy and free. The National Provider Identifier is the result of the mandate in the 1996 Health Insurance Portability and Accountability Act (HIPPA) that the Secretary of HHS establish a standard national provider identifier. Though all healthcare providers will be eligible to receive NPI’s, covered healthcare entities will be mandated to use the NPI as the sole provider identifier on all HIPAA electronic transactions. The 10 digit number will be assigned by a CMS-funded NPI “Enumerator” through the NPPES (National Provider and Plan Enumeration System). The NPI is a numeric 10 digit identifier, consisting of 9 numbers plus a check-digit in the 10th position. It is accommodated in all standard transactions and contains no embedded information about the healthcare provider that it identifies. When filling out your application use Provider Code 22 (Respiratory, Rehabilitative & Restorative Service Providers) and Taxonomy Code 2255A2300X (Athletic Trainer). If you would like more information or have questions about NPI, contact Jason Vian or Amanda Muscatell.